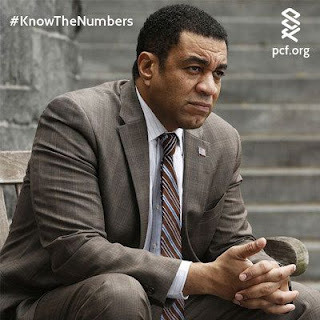 Actor Harry Lennix who currently co-stars on the NBC drama "The Blacklist," is the face of PCF's 2019 "Know the Numbers" campaign, which encourages men to understand their personal risks for prostate cancer. "I am honored to serve as an ambassador for the Prostate Cancer Foundation and to use my platform to raise awareness about this insidious disease which has affected so many people close to me," said Lennix. "In honor of those I have lost, I am encouraging all men, including African Americans who are at heightened risk, to take the time to familiarize themselves with this disease and to take steps to reduce their risk for developing prostate cancer or to catch it early enough to survive it." "Currently, there is focus and large commitment in place to understand why the disparities that affect African American men with prostate cancer exist, and we are finally seeing some progress. But this is not the time to take the foot off the gas; this is the time to accelerate," said Christine N. Jones, Chief Operating Officer, PCF. "We have a two-pronged approach to address this issue - education and awareness - which we know is saving lives on the front end, and investment in science, so we can better understand what is going on so precision treatments can be developed." personal risks for prostate cancer, take charge of their health and save lives by breaking down barriers and talking about the disease. The PCF's new PSA featuring Lennix can be viewed at www.pcf.org/knowthenumbers. The PCF's new "PROSTATE CANCER: Additional Facts for African American Men and Their Families" is available for free download at www.pcf.org. The new guide provides actionable information about what men can do to prevent prostate cancer as well as information about risks and screening guidelines specifically for African Americans. The guide features comments from Chris Tucker, Brian Custer, "Uncle" Charlie Wilson and Snoop Dogg. Also available for free download is a comprehensive Prostate Cancer Patient Guide. Randy Jackson, Chris Tucker, Rev. Rosey Grier and others will be featured in month-long social media campaigns designed to reach men to encourage them to "Know the Numbers." ABOUT THE PROSTATE CANCER FOUNDATION The Prostate Cancer Foundation (PCF) is the world's leading philanthropic organization funding and accelerating prostate cancer research. Founded in 1993, PCF has raised more than $788 million and provided funding to more than 2,000 research programs at nearly 200 cancer centers and universities. The PCF global research enterprise now extends to 19 countries. PCF advocates for greater awareness of prostate cancer and more efficient investment of governmental research funds for transformational cancer research. Its efforts have helped produce a 20-fold increase in government funding for prostate cancer. For more information, visit www.pcf.org.